This recipe comes from my mom’s “other mother” Aunt Geneva, with whom she lived while she was in college. You can vary the amount and types of seasonings based on the tastes of the eaters and/or what will accompany it. I went with about a 1/4 teaspoon each of cumin and garlic. You can use Monterey Jack in place of all or part of the Cheddar, like I did. If you opt for method two (dump it all in the dish and bake) the onions will still have plenty of bite to them. If you want them milder, precooking is the way to go and only takes a few extra minutes. This can easily be doubled and taken to a potluck or even served along side a holiday meal. 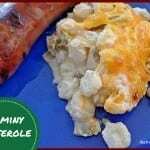 Hominy Casserole - simple and quick southwestern side dish with of hominy, chilies and cheese. Great for pot lucks and barbecues. Preheat oven to 350°. Place baking rack at middle position. Heat hominy, onions, chilies and seasoning(s) for 10 minutes in sauce pan on range top burner. Stir in sour cream. Pour into a baking dish and sprinkle cheese over top. Bake until thoroughly heated, about 20 minutes covered and 10 additional minutes with lid removed. Per Aunt Geneva Smith: You can skip the precooking step and just throw everything into a baking dish and place in the oven to bake! Yum! I love hominy! I’ve never had it like that though, will give it a try. Looks good! I will have to try this. I have a 1975 Joys of Cooking & it has OAT BREAD COCKAIGNE in it. If this is what you want, let me know. Bonita & I both made this & absolutely loved it. I intend to keep hominy on-hand from now on. oooh, I haven’t had hominy in a long time! Thanks for sharing at FTAF! Thanks for stopping by, Chellie. I have a 72 edition and there is a recipe for steel-cut oat bread if that’s the one ? That is the one. Mom ended up getting me a copy and I posted the recipe on the site shortly after this one.